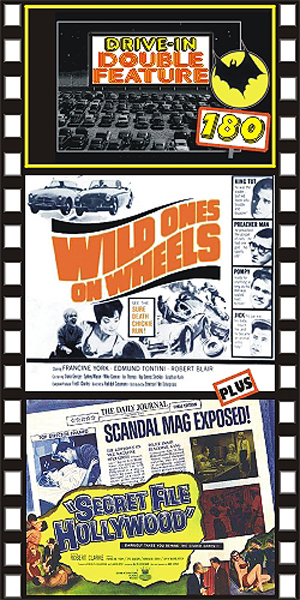 WILD ONES ON WHEELS (1962) Francine York, Robert Blair, Edmund Tonini, Ray Dennis Steckler, Jonathan Karle. A sports car gang murders an ex-con and forces his wife to locate $240,000 he had buried in the desert. York, as the wife (suddenly a widow!) is terrorized by the gang as they drag her across the desert in their mad quest for the stolen cash. Making life very shaky for everyone involved is a looney-tunes psycho named Jick, who gang leader Blair can barely control. Steckler is priceless in a supporting role as “Preacher Man.” Really a very well-made JD film and very under-appreciated. York looks great in blue jeans. 16mm. SECRET FILE HOLLYWOOD (1962) Robert Clarke, Francine York, Syd Mason, Maralou Gray. As the cameraman for this film, Ray Dennis Steckler mentioned to his producers that the microphone was hanging too low in many of the scenes being shot. They told him not to worry because the aperture plates in most theatrical projectors would mask it all out. Boy, were they wrong. Microphones are all over the place in this wildly entertaining exploitation schlocker about an ex-detective who digs up dirt for a Hollywood scandal sheet. One of his stories causes a tragic suicide. A nice big helping of scrumptious drive-in fun! From 35mm.